Sprout Network has gone and added another amazing family-friendly show to their ever popular line up. 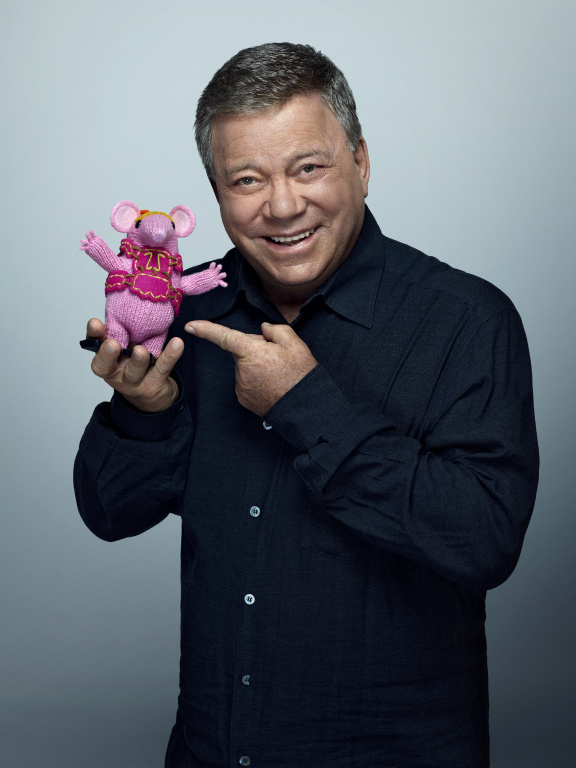 Back on June 20th, Clangers, which is narrated by the one and only William Shatner premiered. I had heard about the show a few days prior when I saw William Shatner making the rounds on daytime talk shows to promote the show. The show sounded liked something my girls would enjoy, and they sure did! Did you happen to catch Clangers when it premiered a few weeks ago on the Sprout Channel? If you missed it, you will definitely want to check your local listings and make a point to watch it with the kids, as it talks about different themes including problem solving, celebrating and understanding differences, diversity, teamwork, loyalty and friendship, kindness, exploration of the world around us and even reusing and recycling. As you know, I have two girls, Bella who is now 3.5 (yes, you have to 3.5, as it sounds older than 3) and Savannah, who just celebrated her 5th birthday today. They tuned in with me back on June 20th to the premiere Clangers episode -- note: this show airs nightly on Sprout! at 7PM EST, so set your DVRs to record this show. I didn't tell them anything about the show, except that it took place in outer space and followed a family of tiny pink creators called the Clangers. I wanted to see their reaction upon seeing the show for the first time, without giving them too much information. And, I was glad I did this, as the girls were talkative from the very start. What really caught the girls' attention was how the Clangers communicated. Instead of talking, they would use high and low pitch whistles to talk. And, with the help of William Shatner as the narrator, the viewers are able to understand what it going on and being said. I don't know about you, but I find that shows that contain too much dialogue are a real turnoff for my girls. They are more into unique audio and animation to keep their attention. And, the whistles and cute space family was a perfect combination that kept them engaged from start to finish and had them asking for more Clangers. 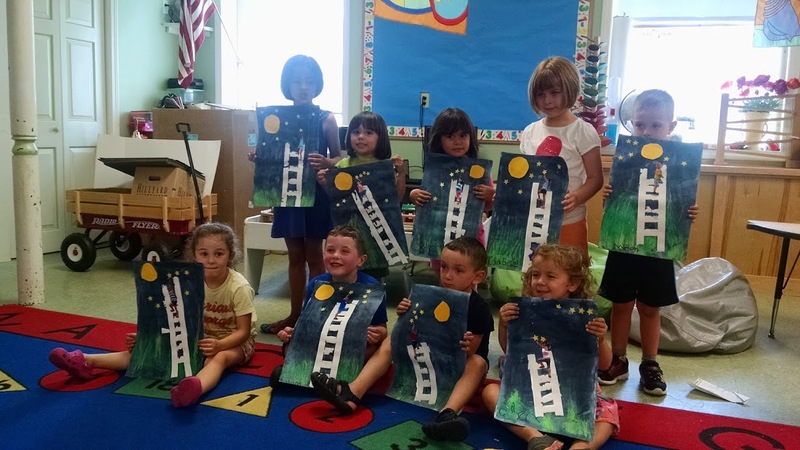 As a parent, I love shows that discuss themes and life lessons that little ones are working on learning. We usually watch a show and then will discuss what was seen and if there was a lesson that was to be learned. Clangers covers so many great life lessons, including celebrating diversity, curiosity and exploring the unknown, family and friendship, just to name a few. Even though Clangers has only been airing since June 20th, we have been tuning in and enjoying each and every episode and talking about the show together, before watching again throughout the week as we have to record the episodes to watch again and again. How can you not love tiny pink creatures who live on a blue planet? 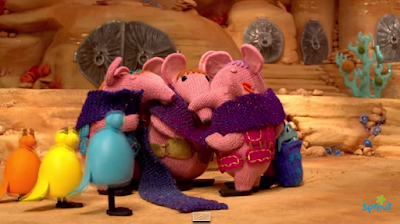 The first episode introduced us to all the Clangers, including Small, Tiny, Granny, Major, Mother. 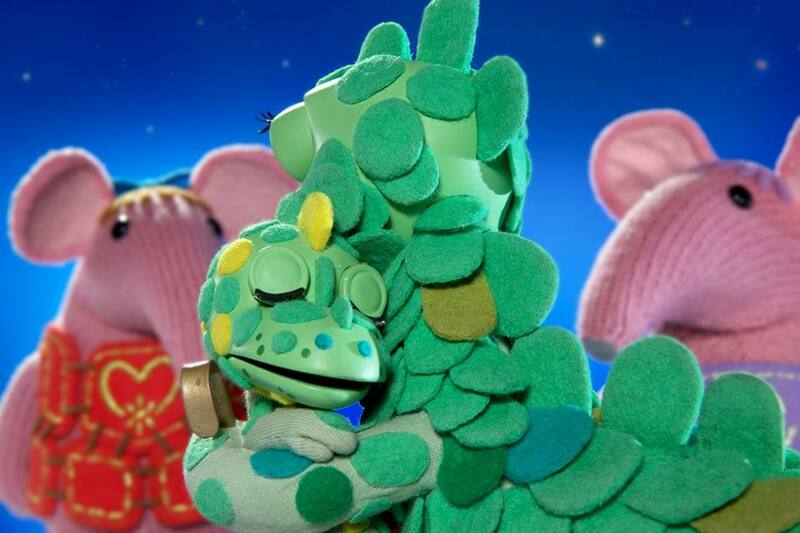 In addition to the Clangers, viewers also are introduced to their friends Iron Chicken, Soup Dragon, the Froglets. I could go on and on about The Clangers as it really is a wonderful show for preschoolers. I am so happy that Sprout brought this popular show to the USA and that William Shatner lends his voice. He speaks in a such a calming voice that my girls really enjoy the show and learning more about the Clangers, each and every time we tune in. So, if you are looking for wonderful educational series for your preschooler that teaches social skills and life lesson, and have Sprout as part of your cable lineup, you will definitely want to tune in each and every evening at 7PM EST. Once you meet the Clangers and their friends and hear them communicating through high and low pitched whistles, you will see why my girls and so many other Sproutlets can't get enough of this new series. This looks cute and I love William Shatner's voice so this one should be good.